Many variations of spelling of this name - MacGuinness or MacGenis, Magennis or Magenis, a form still to be found in some places today. In Irish the name is MagAonghusa, i.e. son of Angus. They are descended from Saran, chief of Dal Araidhe in St. Patrick's time and thence to Eochaidh Cobha of Iveagh, County Down. Like the chiefs of many of the great Irish septs Magennis took advantage of the English policy of "surrender and regrant" warly in the seventeenth century; earlier they were often at loggerheads with the ecclesiatical authorities and they showed a tendency to accept the tenets of the Reformation; conforming bishops include two Magennisses - one of the diocess of Down, the other of Dromore. However, by 1598 the Magennis chief of the time, whoe father was officially regarded as "the civillest of all the Irish in these parts," had joined Tyrone (who was his brother-in-law) and thus "returned to the rudeness of the country." A generation later their loyalty to Ireland and the ancient faith was undoubted. The Franciscan Bishop of Down and Connor, Hugh Magennis (d. 1640), was closely related to Viscount Iveagh and many of the Gaelic nobility of Ulster. They were consistently on the Irish side during the resistance to English aggression in that century and after the disasters following the battle of Boyne they were finally dispossessed of their wide patrimony in Co. Down, much of which had been planted with English (not Scottish) settlers after the Cromwellian war. Many of them took service as Wild Geese. The best known of these was Brian Magennis, second Viscount Iveagh, who was colonel of Iveagh's Regiment in the Austrian Imperial Army and was killed in action in 1703. His brother Roger Magennis, third Viscount (d. 1709), served both France and Spain with distinction. The present Lord Iveagh (of the second creation), head of the largest brewery concern in the world - Guinness of Dublin - though not a direct descendant of the lords of Iveagh mentioned above, belongs to a cognate (McCartan) family of Co. Down, This family spent very large sums on improvement of housing and social conditions in the city of Dublin as well as on the upkeep of St. Patricks Cathedral and its surrounding. Jane Magenis' father must have passed away by the time of her marriage, (will probated in 1758, IIW # 40580) because her Uncle Roger Magenis provided her dowry at the time of her marriage in 1790 to James Belmont Marmion in Dublin. 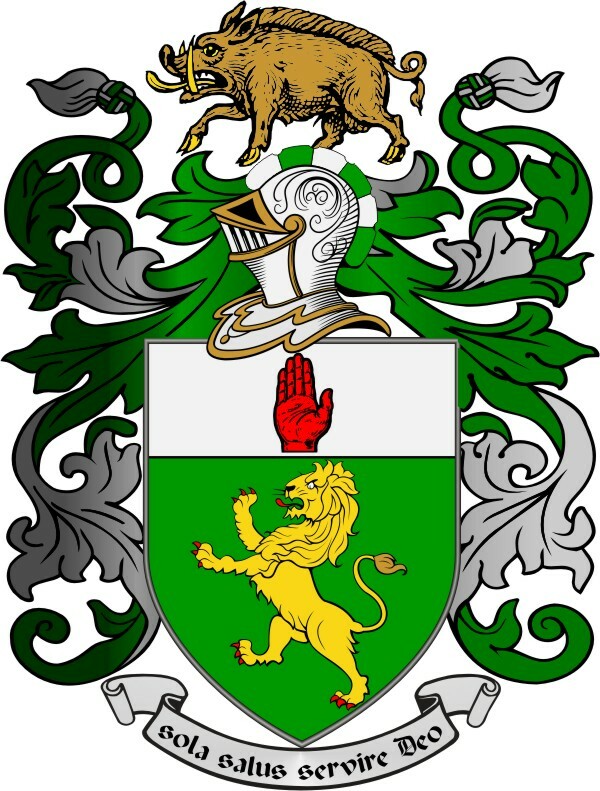 Magenis of Dromore, Balooly, County Down, Northern Ireland (keep in mind, Roger Magenis,Balooly or Ballely, Dromore, is Arthur Marmion's Great Uncle, his mother Janes Magenis' father Arthur's brother) The son of Arthur Magenis, and brother of Jane Magenis Marmion was John Magenis, one of the leaders of the United Irishmen in County Down Northern Ireland, who married Batholomew Teeling's sister, Bartholomew Teeling being part of the Wold Tone Rising of 1798. The children of Roger MAGENIS were Arthur L Magenis born in Belfast, Bartholomew Teeling MAGENIS, Eliza MAGENIS of Belfast and of Baloolly), (Co Down), The family owned the estate "Balooly" sometimes also known as Ballela. Is Jane Magenis Marmion the sister of Richard Magenis, who married into the Cole family? He had 2 sons with the name "Arthur"
1843 Belfast- Magenis, Bartholomew Teeling, 1 Donegall Lane, residence, 95 Donegall Street. Letters of Administration (with the Will annexed) of the personal estate of Roger Magenis late of Ballyaley County Down Gentleman deceased who died 21 December 1872 at same place were granted at Belfast to Anna Magenis of Ballyaley (Banbridge) aforesaid Spinster the Sister and Universal Legatee. In 1819 Arthur Magenis immigrated to the the US and to the state that was Gateway to the West, Missouri. He was an attorney at #29 North Church Street in St Louis MO., he became the U.S. Attorney for Missouri, 1834-40. Arthur L.Magenis Esq. died in Feb 1848. Erin Benevolent Society of St Louis, Missouri. 1818, Feb. 9. ERIN BENEVOLENT SOCIETY. ciety was held at the house of Jeremiah Connor. James McGunnegle, John Mullanphy, Alex. zell." This deed was defectively acknowledged. In partition proceedings between Rankin and Schatzell, in 1828, the entire lot was sold to Rankin. In 1828 said Rankin conveyed the south half of said lot to Arthur L. Magenis. On the 20th of January, 1848, Sophie Chouteau sold and quitclaimed to Rankin the north half of the entire lot. In this deed the deed of 1827 is referred to. Auguste P. Chouteau died in 1838. Arthur L. Magenis went into possession in 1828, and possession under him has continued uninterruptedly until the present time. He made valuable improvements. The plaintiff claimed to recover one-eighth of that portion of the lot which was conveyed to Magenis. The court, by its instructions to the jury, ruled that the divorce of Honey and wife was void; that the deed from Honey to his wife Marie Antoinette Honey was inoperative as a conveyance to the wife. The plaintiff recovered one-fortieth of the lot sought to be recovered. Writs of error were sued out by both plaintiff and defendants. Pierrie Chouteau was ordered to pay Arthur Magenis by the American Fur Company. It is unclear if it is related to the above. Arthur Magenis was a witness to the trial of the Impeachment of Judge James H. Peck, Judge on the United States District Court of Missouri. Arthur attended the Democratic National Convention at Baltimore, MD May 27, 1844. He was a Missouri delegate for the seventh district and a Democrat elector.. After Arthur denounced the Polk-Dallas ticket rumors began circulating that he may be mentally incompetent, despite the Whigs protests, he quickly replaced as and elector, even though he refused to resign. Montgomery Blair, of Missouri, to be attorney of the United States for the district of Missouri, in the place of Arthur L. Magenis, resigned. Washington, December 16th, 1840. These dogs were purchased in Matanza Cuba and used in the Indian Wars in Florida. Joel Poinsett was Sec of War 1834 to 1841. The dogs greatly aided the end of the wars there. Note: In the case files there are two folders; one with a list of correspondents and transcriptions of their letters; another with a list of Story manuscript holdings at the University of Texas. 1-29 Magenis, Arthur L., s.a.
Lieutenant-Colonel�Enlisted at a camp near Little Rock, Arkansas, October 1, 1862; age 28; relieved by election, November 28, 1863. Arthur J. Magenis. Quartermaster, Second Missouri Militia, November, 1861 (recorded in the Official Records of the Union and Confederate Armies), when he was exchanged for Captain E. C. Thomas, Thirteenth Missouri Volunteers (Union service); First Lieutenant and Adjutant, Twenty-seventh Arkansas Infantry, July 14, 1862; Lieutenant Colonel, October 1, 1862; Adjutant and Inspector General (Confederate), February 15, 1864. It is mentioned in the records of the War Department, Washington, that he was serving in that position, February 21, 1865, but there is no later record of his service. .
Arthur J. Magenis, New Orleans, La. '55. Lawyer. died Oct. 22, 1867 ; was Col. in Confederate army. On July 2 1863, in the afternoon Captain William M. Magenis, assistant adjutant-general of he division, a valuable officer, was murdered by a Captain Murphy, whom he places under arrest for robbing a citizen. Murphy made his escape 3 days later as his court-martial was convening.